Siberian Huskies are intelligent and adept at problem solving. Most Siberians love people and make excellent family dogs. Siberian Huskies are athletic and make good walking/hiking/jogging partners in cool weather. Siberian Huskies have a pronounced sense of humor. They usually use it to humor their owners! Siberian Huskies are attractive dogs with an exotic look. Siberian Huskies are poor watchdogs. They love everyone! Many Siberian Huskies possess a high prey drive which manifests itself by chasing small animals. 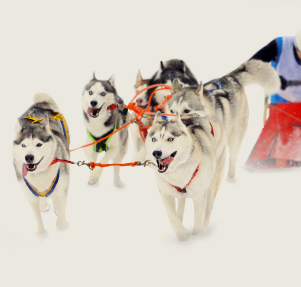 Even trained Siberian Huskies, when off-leash, usually will not come when called. Some Siberian Huskies are escape artists. Some Siberians require a genuine fortress in place of a regular fence. Siberian Huskies have lots and lots of fur that sheds at least twice a year. Siberian Huskies are gardeners. They dig really big holes! Siberian Huskies cannot tolerate long periods of isolation. Before considering this lovely breed there are some potentially negative instincts that you must consider. The following paragraphs provide excellent information so that you can make an informed decision before you decide to adopt a Siberian Husky. Remember, there is no breed suitable for everyone! Siberian Huskies were bred to run and run and run. They are VERY independent, self-confident, “what-me-worry?” types. They would rather see what’s on the other side of that hill than worry about getting lost. If you don’t keep a Siberian on a leash or in a properly fenced yard (6-foot fence) or kennel, sooner or later they WILL run off, we promise you that. So you have 200 acres? The size of your acreage is not a natural barrier or deterrent. And they certainly do not look both ways when crossing streets, either! No matter how expert your dog-training skills, you will not be able to “teach” a Siberian not to run any more that a retriever can be trained not to retrieve, or a Border Collie not to herd. Siberian Huskies are very intelligent. This is often interpreted as severe stubbornness. They do not always strive to please their owners, unlike many other breeds. Obedience training is a MUST, as is extreme patience. And don’t let some instructor tell you they can’t be trained. Siberian Huskies CAN do it, but they need to be convinced that it is their own best interests to do what you ask—“because I said so” doesn’t cut it. They are possessed of a unique sense of humor unmatched by most breeds, and often are considered the “class clown.” Laugh at their antics and you can be sure they will be repeated. They like to see just how much they can get away with, and then try to take it a few steps further. Often an adult dog is a better choice for some people, since puppies of any breed can push you to your limits…and a Siberian puppy will take it even further! Siberian Huskies are neither guard dogs nor watchdogs, contrary to their appearance. They will not protect you or your property. Most never even bark! Siberian Huskies are pack animals, REQUIRING the company of other dogs or humans. Leaving a pack animal home alone for a couple of hours can wreak havoc on your carpet, your sofa, your dining room table. Left outside, a lonely Siberian will dig under the fence, undo any child-proof locks, open the gate, or howl endlessly. 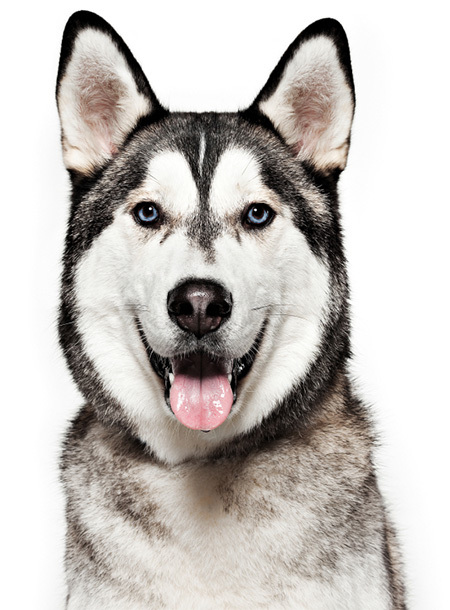 Housetraining a Siberian, as with any dog, can be relatively easy—or take many weeks and even months of patience and persistence on your part in order to succeed—but succeed you will. Siberian Huskies shed non-stop year-round, but at least once a year it comes out in clumps. You will probably never again wear black. And you will need a new high-powered vacuum cleaner…dog hair EVERYWHERE! Siberian Huskies love to dig crater-sized holes both inside and out. A creative Siberian might decide that a good place is right in the center of your bed, through your expensive down comforter. Bred to pull, Siberians can be quite a challenge to walk. They are extremely strong for their size, able to pull many times their weight. For this reason especially, obedience training is a must. Siberian Huskies have a fully-developed predatory instinct, which can manifest itself with squirrels, bunnies, birds, cats, and even small dogs. This cannot always be prevented, and requires vigilance on your part to control it. Siberians are fearless. They aren’t afraid to step into traffic. Rurally, many Siberians are mistaken for coyotes and shot by farmers protecting their livestock. They are cheerful dogs with a positive outlook on life that is contagious. Out in public, Siberians are outgoing and friendly, not to mention beautiul. Siberians love children and seem to have an innate understanding that they must be gentle with tiny folks. You will most certainly be approached by others when walking your Siberian Husky, and teaching the dog to sit and accept the attention he loves is desirable. Most adult Siberians are calm and dignified indoors and are possessed of cat-like grace when maneuvering around furniture, as well as the independent and aloof nature of a cat. Cat-like, also is the Siberian Husky’s complete absence of any odor. They should be bathed every 10-12 weeks and regular brushing will help to minimize the year-round hair accumulation, (and is essential during the shedding season). Siberian Huskies are athletic dogs that enjoy outdoor activities, and make wonderful jogging partners. With the use of a specially designed devise called a “springer,” and some training, they will happily accompany you on bike rides. Of course, the Siberian must ALWAYS be leashed when participating in such endeavors. A free spirit, non-conforming, sometimes aloof, and at the same time gregarious and friendly…you will love the Siberian Husky if you can accept the independent nature of this wonderful breed. What do I feed my Siberian Husky? We recommend that adopters use Nature's Select Chicken, Lamb and Rice, or for sensitive stomach's, Grain Free. Where can I find a trainer? For valuable information on our recommended trainers and practices, please visit our Obedience Training section. How do I become the leader of my dog? For helpful exercises to allow you to become the leader of the pack, and establish rules for your dog, read our Leadership Exercises. There are a few simple guidelines to follow when introducting your new dog to your cat for the first time. Check out our Dog Meets Cat section for some great tips! How do I overcome separation anxiety? Many dogs have problems being left alone without their owners. We have created a list of guidelines to follow to help you treat this problem. Check out our Separation Anxiety guidelines for more information.